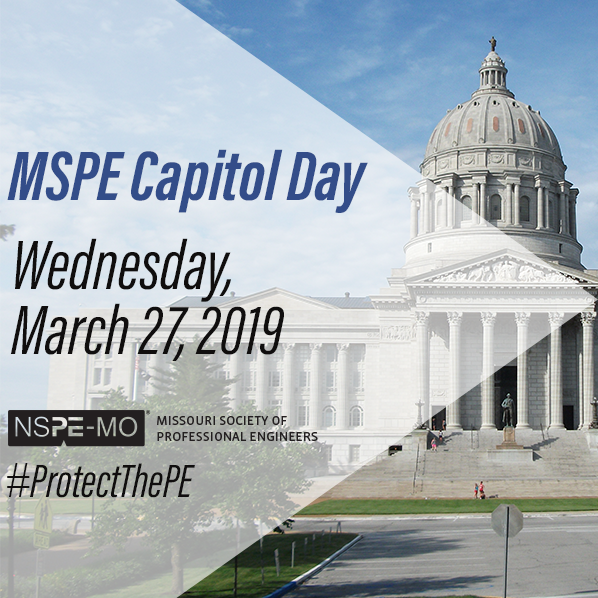 Join MSPE for Capitol Day in Jefferson City on March 27th! JEFFERSON CITY - Members of the Missouri Society of Professional Engineers are requested to advocate for industry issues at the 2019 Capitol Day. On March 27, MSPE teams up with ACEC Missouri and the Mercury Alliance’s advocacy day to spend the day learning and meeting with state legislators. Don’t miss out on the opportunity to help educate lawmakers on issues of importance to Licensed Professional Engineers! To give MSPE the best opportunity to schedule legislative visits with local legislator, please register by March 10.